LAURA LOUISE HAYNES: O U T F I T | How am I gonna be an optimist about this? O U T F I T | How am I gonna be an optimist about this? Hey bloggers. Been a while since i did an outfit post so thought i would post two of the outfits i had worn this week. I had some new purchases because i had a wild impulse shopping spree a few days ago, ooops. I deserved to treat myself to be honest...so i keep telling myself to make me feel better anyway. 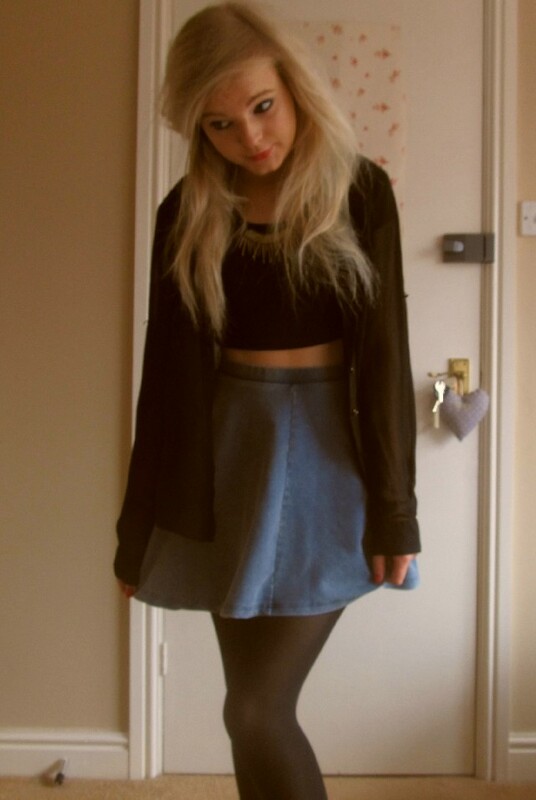 The denim blue skater skirt is making a come back it seems, i got this from Topshop for £20 which i didn't think was too bad to be honest. I like it because i think it goes well with the whole 'grunge' look as well as it being suitable for a more summer look when the hot weather starts to hit (well lets hope it does). The crop top is also topshop, and the shirt was from Newlook which i had bought a while ago, you can get them from pretty much everywhere though. .
Just a quite casual look for when i popped into uni, i had on my big fur coat though because i think i would have got a bit chilly with my stomach being on display that little bit...haha. Ok, so i am a member of the van hype. I can't help but love these though, it's the colour that i love most, and they are quite chunky and at the minute chunky shoes seem to be everywhere! Creepers etc. 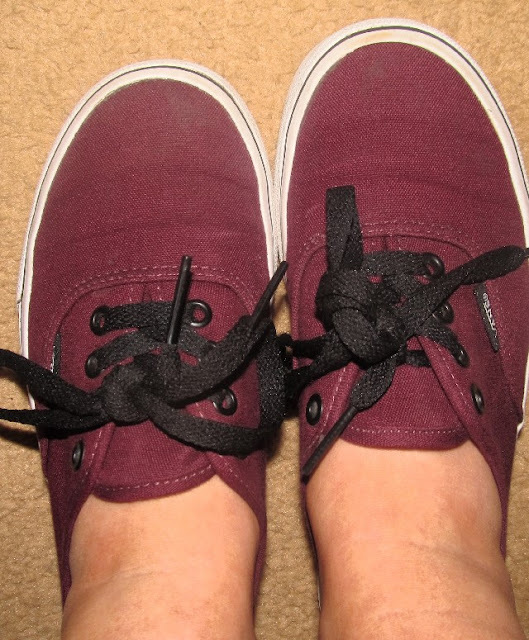 I wear these when i want to be comfy but not fancying my converse. Oh and also don't be stupid like me and go a long length of time without socks on, it gets pretty painful after a while.. I would have worn cute ankle socks with this outfit but i didn't have any around! The polka dot shirt is from new look and i love polka dots at the minute. They also had the shirt in black with white spots, but it wasn't in my size, typical! The shops are starting to sell clothes for the summer season have you noticed? It's annoying because we know the weather in England is just not right for it yet and so it makes shopping so difficult. It's good to prepare i guess but i hate the fact of buying clothes and them being hung in my wardrobe for ages getting no use! Is it better to prepare or carry on window shopping until the weather picks up ? love both looks , that skirt is amazing. I love your blue skirt. Cute. And I thinke your blonde hair is very beautiful. In my latest post I introduced a outuber who have pretty hairstlyes. When you have interest, you can go to see. I love that skirt from the first photo, it's gorgeous! Wow beautiful look!!! would you like to follow each other?